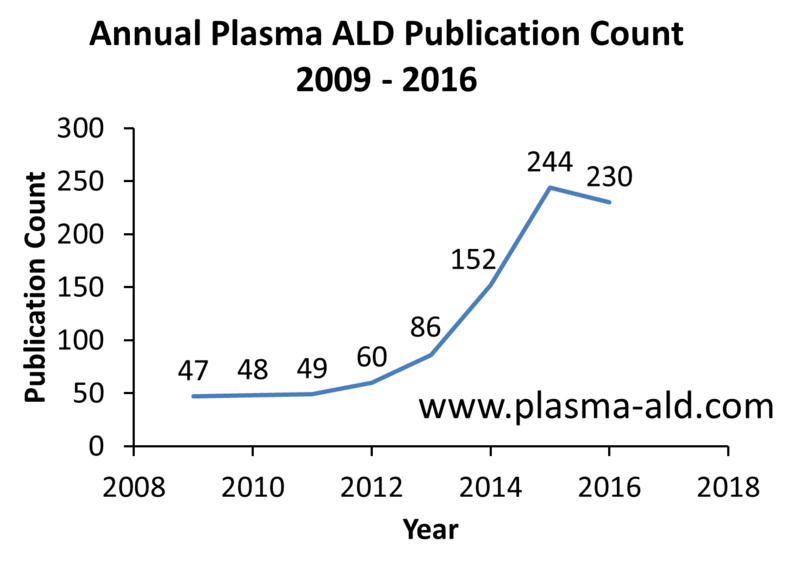 I have found a few more 2016 PEALD papers since I put together the poster for ALD2017 in Denver. Below are updated plots. Here are the number of publications per year since 2009. Strong growth has been seen through 2015 but 2016 did not continue the trend. Admittedly, I have become slightly more selective in what I include in the database. I do not leave out any journal publications I find, but I will not include a conference talk based purely on an abstract. I do include any write-ups from conference proceedings I find. I estimate the number of ignored conference abstracts not included in this years tally that might have been previously included to number in the 10-20 range. Just enough to make 2016 pretty much in-line with the 2015 numbers. Acceptance date is used for determining the date of a publication. 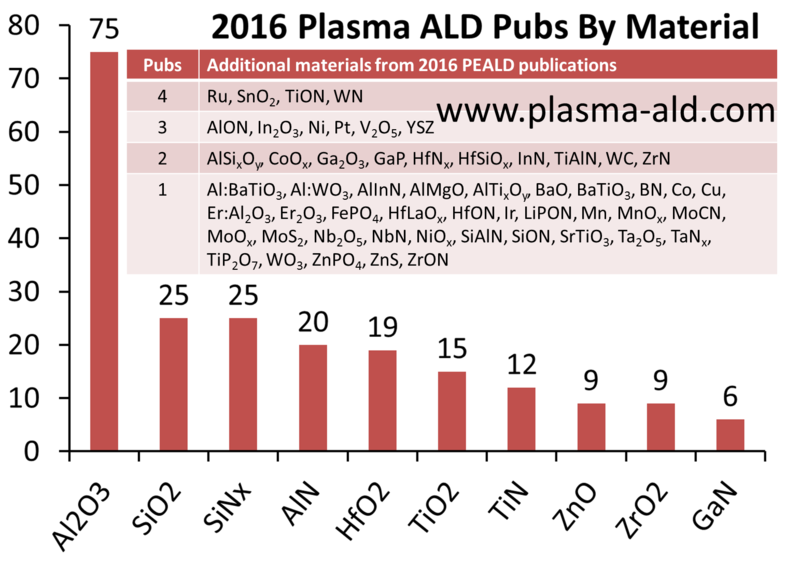 References included 64 different materials by PEALD in 2016, 3 less than in 2015. Below is a publication frequency plot for all materials discussed in 2016. Al2O3 again led the pack. SiO2 and SiNx tied for second most common material. 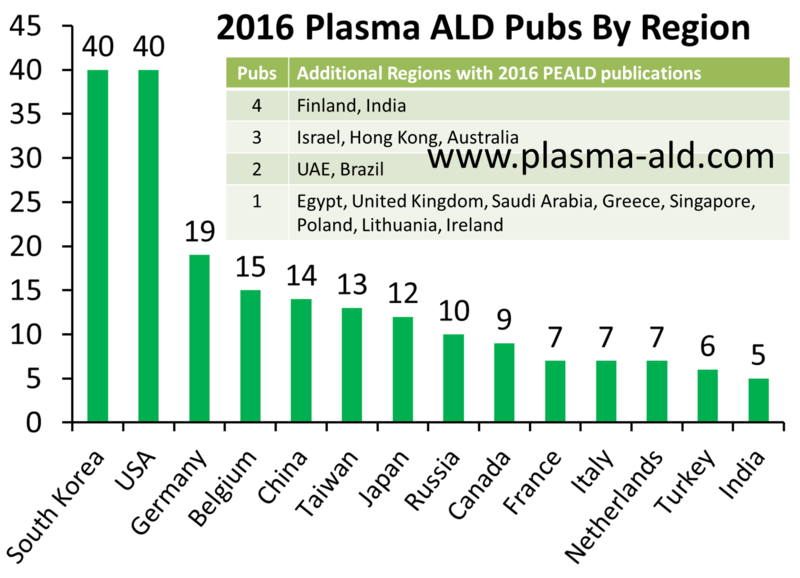 Plasma ALD publications came from 29 different countries in 2016. South Korea and the USA tied as the top PEALD paper producers. Germany had a strong 3rd place showing and Belgium grew 50% to move into 4th place. The region for a paper is based on the location of the first author's institution.